This is a free sample containing the first 25 pages of this issue. 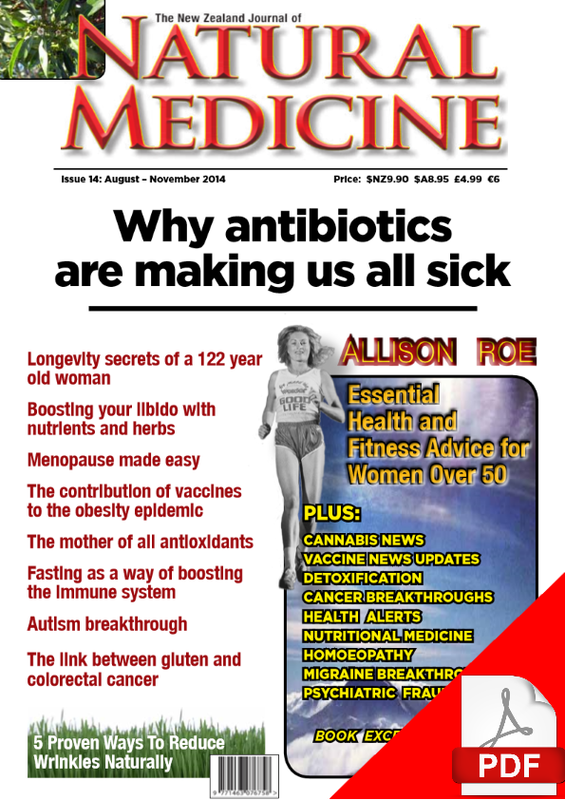 Issue 17 of The NZ Journal of Natural Medicine covers the “hot button” issue of vaccination. In Australia, Tony Abbott’s recently announced that families who have “conscientious objector” exemptions from vaccinating their children will lose these exemptions on January 1, 2016 and no longer qualify for “Child Care Benefit and Child Care Rebate and the Family Tax Benefit Part A end of year supplement)”. The loss of these benefits could cost a family approximately $15,000 per child. While Prime Minister John Key has ruled out a coercive vaccination policy here, a prominent Northland GP has called for parents to be “compelled” to vaccinate their children, kicking off a national discussion on the vaccination issue here. Accordingly, this issue take a hard look at vaccinations: their side effects and effectiveness – and most importantly presents the evidence that unvaccinated children are generally healthier than their unvaccinated peers. 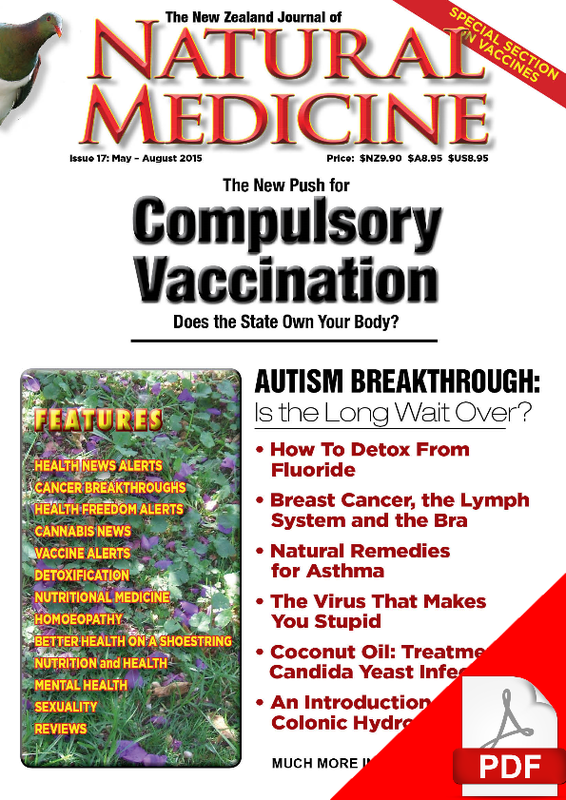 For people who have suffered a vaccine-injury, a feature article in this issue also discusses how homoeopathy can be used to start the healing process. Maintaining good health over winter – and for a lifetime – is also covered in this issue, with editor Katherine Smith’s column “Better Health on a Shoestring” providing a succinct overview of the health benefits of vitamin D.
Also in this issue, in a review-essay of Kerri Rivera’s book Healing the Symptoms Known as Autism, we examine a new treatment that addresses the chronic infections and/or parasitic infestations suffered by some children on the autism spectrum. Issue 17 investigates herbicides like Roundup that contain glyphosate as an active ingredient. Thanks to the creation of “Roundup-ready” genetically engineered crops such as soybeans and corn (which can be sprayed with glyphosate without killing the crops), glyphosate is contaminating the food supply at unprecedented levels. Increased exposure to glyphosate may be partially responsible for the increased numbers of children who have autism spectrum disorders. Glyphosate may also be used to kill wheat plants prior to harvest and this may be contributing to the development of gluten intolerance. In our article on detoxification for this issue, naturopath Jillian Merz from the Colonic Health Centre discusses the history and health benefits of colonic hydrotherapy in which purified water is used to flush away accumulated waste. Do you have any aches or pains? 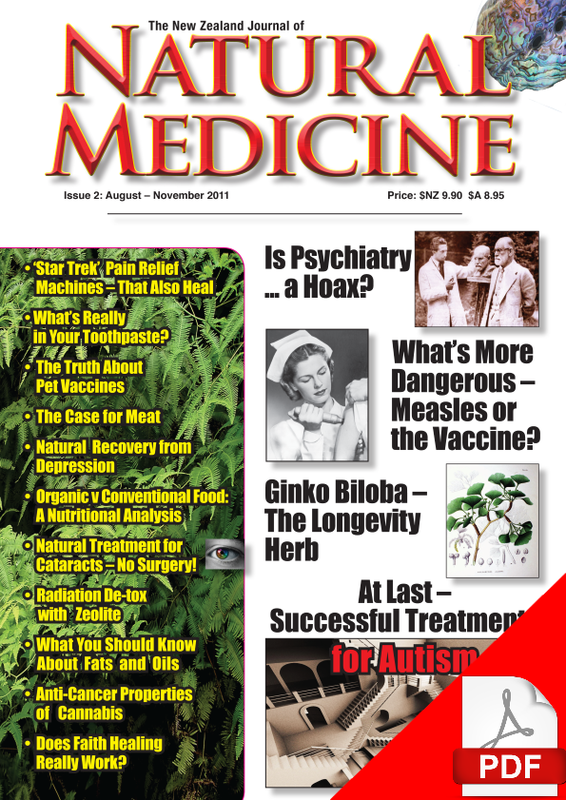 This issue also features an article on natural pain relief options. 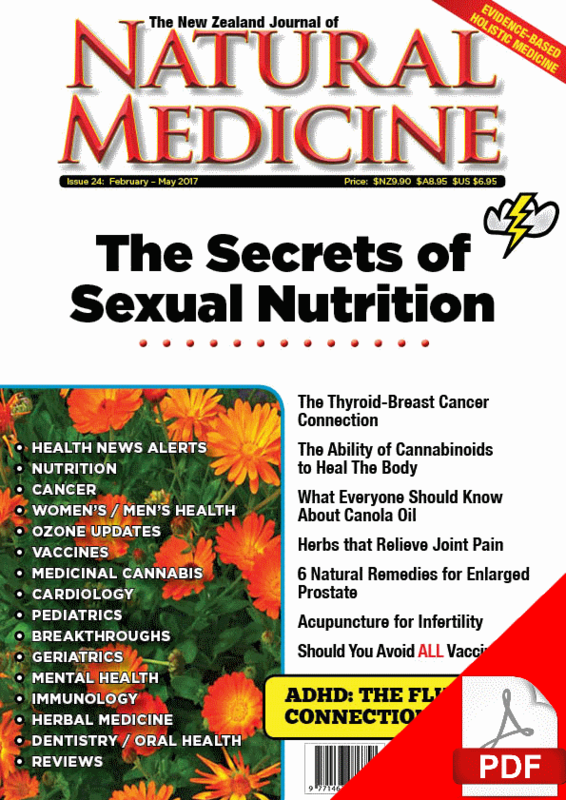 Sexuality also features on this issue, with an article by Sayer Ji, PhD on alternatives to Viagra.